Musings from Little Grove Farm: There is Ilmenite in them thar hills! 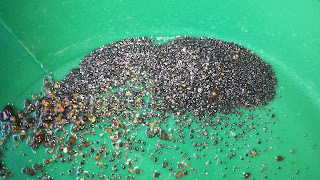 This afternoon I and my son tried our hands at panning for gold in the Sierra Nevada foothills of California just east of Sacramento. After a while, we began to understand that there might be some art to this whole "panning for gold" thing. To start with, pick a stream that actually contains gold. However, we really weren't looking for gold. We were looking for magnetic sands - my son is intensely interested in magnetism (and mushrooms, and lizards, and many more things). The dark, heavy sands that, in many nearby streams, often indicates you are in the right general area to find gold, in this case indicate that you are in the right general area to find dark, heavy sands. To many folks, these sands are not interesting. We are not those folks. With a small Rare Earth magnet (any decent magnet will work), a plastic bag (magnets rust if they get wet), and a gold pan, we successfully collected many grams of real, genuine, magnetic sand. First, it is fun to play with with a magnet and is a clean material for field visualization. Second, it is a neat organic additive to soils low in iron to add that critical mineral as well as potentially other trace minerals to our soils. Next up: what is the mineralogy of this sand? We'll explore that using some simple tools next.